You know that feeling – you’ve been out in the sun for a few hours and you’ve achieved that perfect golden tan you were hoping for. But then you run into a little problem – your skin is now dry and itchy, you start to peel a bit, and your tan is going away fast. Did you know that there was a solution to avoid these after-sun side effects? It’s a simple one: hydration, hydration, hydration! When your skin is newly tanned, it looks great, but it’s likely suffering from dehydration as well. You want to hydrate your body from the inside and the outside – drink lots of water, and moisturize your skin with a high-quality product. This isn’t just important for the short-term results of keeping your skin healthy and your tan fresh, but it also reduces long-term effects of sun damage such as premature aging and wrinkles. But how do you know which products are actually going to provide you with the hydration your body needs? What is the best lotion to keep a tan? Not to worry – SimplySunSafe has done the research for you! 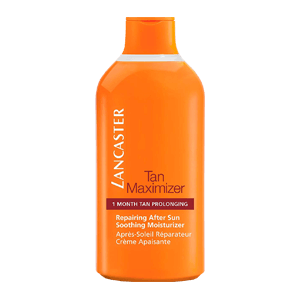 After looking into various different products on the market, I recommend Lancaster Tan Maximizer Soothing Moisturizer as the best moisturizer to keep a tan. Keep reading for a detailed buyer’s guide, comparison table, and in-depth reviews of the top 5 lotions to find the best after-sun treatment for your needs. Having a look at the ingredients list on cosmetic products is not what I’d necessarily call a fun activity, but it’s an important one! It’s a good idea to be aware of what exactly you’re putting on your skin. Products with a long list of hard-to-pronounce ingredients? Yeah, you’ll definitely want to check those! Of course not knowing what an ingredient is doesn’t automatically make it bad though! Thankfully the internet has tools that can help you decipher the cryptic lists – you can copy and paste any product’s ingredients list into product analyzers such as this one by Skin Carisma. It will provide results on each individual ingredient and tell you what’s good, what’s bad, and everything in between. Glycerin: Glycerin is the second most often used ingredient in cosmetic products after water! It is a naturally occurring humectant that cools skin. Even synthetically derived glycerin is safe, because our bodies react the same way as they do to natural glycerin. Xanthan Gum: This is a commonly used natural thickener in cosmetics. One downside of its use is its potential to leave a sticky residue. Bisabolol, aloe vera: These are natural soothing agents that reduce irritation and promote healing. Linalool, Citral, Citronellol, Limonene: These are all elements that are found in a variety of essential oils such as lavender, orange, and rose. They’re often used for their pleasant aromas to make products smell good. While natural and beneficial in a variety of ways, they can also be allergens and cause irritation to sensitive skin so buyers beware if you have sensitivity to these ingredients. Parabens: Parabens are used to prevent the growth of unwanted bacteria in a wide variety of cosmetics. While they are not directly harmful and are almost always present in very low quantities, parabens have been linked to various health risks after prolonged use. You can find out more about parabens from Safe Cosmetics. Moisturizing your whole body after being in the sun can sometimes feel like a chore – but using one that makes your skin smell delicious makes it worth all the effort! For this reason, you will want to buy a moisturizing product that encourages you to use it by having a smell you love. Besides that, if you have a product with a smell you don’t enjoy, even if it works wonders for your skin, you probably won’t use it! If you are someone who is sensitive when it comes to smells, you should check customer reviews and product labels to see if any scents are listed to make sure it isn’t too strong, and to make sure it sounds like a smell that you would like. After thorough research into the different after-tanning products on the market, which included analyzing product reviews, examining manufacturing details, and partaking in skin care forums, SimplySunSafe has chosen Lancaster Tan Maximizer Soothing Moisturizer as the top option. Each recommended product moisturizes very well, works to enhance your tan, and each one also has very high customer approval ratings. This luxurious Lancaster’s product is SimplySunSafe’s pick for the best moisturizer to keep a tan. It relieves skin that’s been out in the sun while prolonging tans for up to one month! It has no added color, but it has a specially formulated Tan Activator Complex (T.A.C.) which increases melanin production for a longer-lasting, quicker, deeper, more beautiful tan. Not only does it deepen and darken your natural tan, but it keeps skin feeling soft and moisturized, all while having a delicious light scent. There’s no surprise here why it’s been described as “miracle juice” for your skin! Additionally, it is free of parabens and sulfates and it has anti-aging and acne-fighting properties. The only downside to the Lancaster Tan Maximizer is that it is quite expensive. However, if price is not an issue, I definitely recommend this product for its high quality and effectiveness. Get Lancaster Tan Maximizer Now! Golden Star Beauty’s Tan Extender Body Lotion comes a close second for SimplySunSafe’s most recommended after-sun moisturizers. We love this product because it’s made with pure, organic, natural ingredients and is curated specifically to extend the life of your tan. It has all that you may want in an after-tanning lotion while being ethically responsible! This lotion extends tans at least three days longer, and skin is left silky smooth. It is also a non-comedogenic and non-sticky product, which works for all skin types and all kinds of tans, even very sensitive ones. It’s made with no chemicals, parabens, or formaldehyde, and is gluten-free, cruelty-free, and vegan. Its natural ingredients will not only extend your tan, but they will work to make sure it fades evenly. One thing to consider in this lotion is that it contains DHA (Dihydroxyacetone), which can be both good or bad depending on your preferences. DHA is naturally derived from sugar beets or cane sugar and it interacts non-toxically with amino acids on the skin’s surface, which darkens the skin. However, caution must be taken to wash lotion with DHA off hands after application, since they can darken palms if not removed promptly. Contains DHA so caution must be taken to wash hands after application. Get Golden Star Beauty Tan Extender Now! Sun Bum Cool Down Hydrating After Sun Lotion is another amazing option to maintain your tan after sun exposure. It’s specifically designed to nourish skin that’s been in the sun, and to reduce peeling to keep your tan looking fresh for longer. The formula is light and non-greasy and can be used on adults and children alike, plus it’s dermatologist tested to be hypoallergenic. It absorbs quickly and is 100% vegan. SimplySunSafe especially loves that the Sun Bum Cool Down line comes in three different application types: lotion, spray, and gel. This gives users options to buy the same great product in whichever application they like best. And no matter which application type, all products maintain the same fresh cooling ingredients to moisturize your skin and preserve your tan. 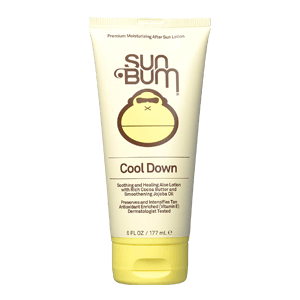 Get Sun Bum Cool Down Now! 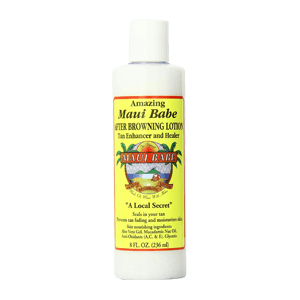 Maui Babe After Browning Lotion is a classic after tanning product from Maui, Hawaii. It has a special formula that works to heal dry skin that has been damaged by the sun, salt, and wind. It does not have any added color, but it prevents peeling and flaking after tanning or burning, and also locks in tans and prevents them from fading. Not just that, but this Maui Babe product is appropriate for all-year usage as a general skin moisturizer for softer, smoother skin, especially for people living in very dry conditions. Its most active natural ingredients are Macadamia Nut Oil and Aloe Vera, which both work to soothe and moisturize skin after tanning. Unfortunately this product does contain parabens however, and it is also quite expensive. Get Maui Babe After Browning Now! This after-sun formula is rich and creamy, and is loved for its delicious tropical scent and its soothing effects on skin. 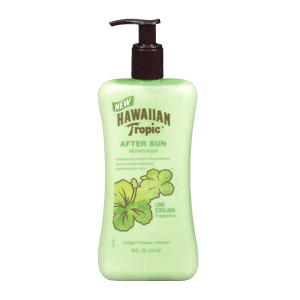 Containing island botanicals, aloe vera, shea and cocoa butters, and fortified with vitamins A and E, Hawaiian Tropic After Sun Moisturizer rejuvenates skin that has been damaged by the sun, wind, and water. SimplySunSafe does not recommend it as the best option since it contains a long list of ingredients which include parabens and alcohols, and I especially suggest avoiding it if your skin is burned or irritated. However, in other cases, it is a very light, non-greasy lotion that can be used on sensitive skin and which will help you keep your tan looking just-out-of-the-sun fresh. Get Hawaiian Tropic After Sun Now! I wrote this guide for people looking for the best moisturizer to keep a tan. Hopefully you have gained more knowledge about different products on the market by reading this article. I am confident that you are now equipped with the tools to make a decision on which is the best moisturizer that you can use to keep your tan looking beautiful and fresh. 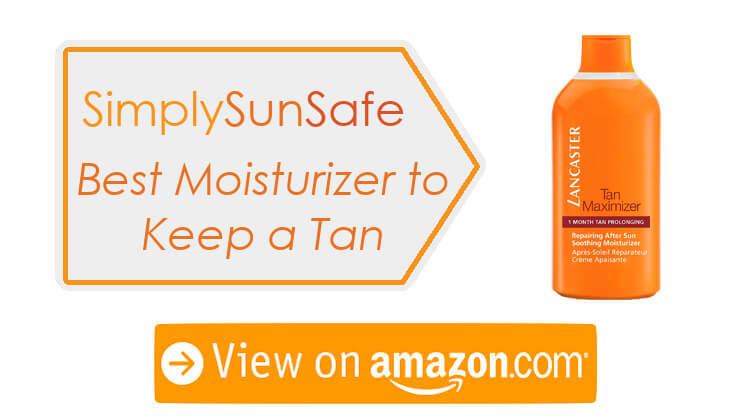 While all listed products are great for different purposes, SimplySunSafe recommends Lancaster Tan Maximizer Soothing Moisturizer as the overall best moisturizer to prolong a tan for its high-quality Tan Activator Complex, which produces long-lasting results. Other options listed are also great for other needs. 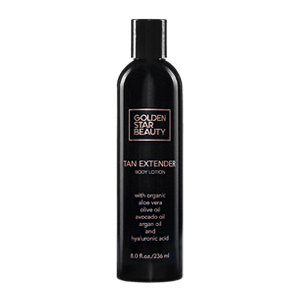 If you are looking for a product that will add some extra color with DHA, Golden Star Beauty Tan Extender Body Lotion is a great option. This product and Sun Bum Cool Down Hydrating After Sun Lotion are also both natural, vegan options for the environmentally-conscious. Maui Babe After Browning Lotion is a classic product which has many natural ingredients and proven results, and Hawaiian Tropic Lime Coolada After Sun Moisturizer is a more economic option that is also reef-safe! I always love to learn about other new products and to hear about your experiences with the ones listed so if you have any feedback or a suggestion of another great moisturizer that helps prolong tans, please leave me a comment below and I will see about featuring it in another article!